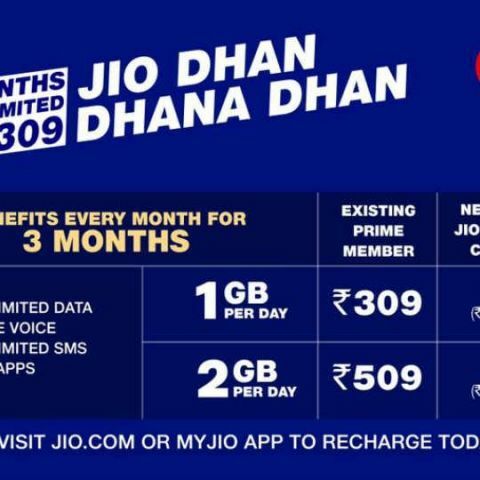 Reliance Jio has unveiled a new offer called ‘Jio Dhan Dhana Dhan,’ which offers free unlimited data, free voice calling, unlimited SMS' and access to Jio’s apps for three months. Existing Prime members can pay Rs. 309 to get 1GB of data per day, or pay Rs. 509 to get 2GB data per day. Those who haven’t subscribed to Prime will have to pay Rs. 408 and Rs. 608 for the two plans respectively. Further, it should be noted that these plans are only valid for the first recharge. So those users who have already paid Rs. 303 for the Summer Surprise offer are not eligible. However, they will still get to enjoy the benefits of the Summer Surprise offer. The new Jio Dhan Dhana Dhan plan comes just a few days after Jio heeded the advice of the Telecom Regulatory Authority of India and scrapped the Summer Surprise offer. However, the company had said that those users who had already subscribed to the offer would get it. This new offer might lead further issues with Jio’s competitors. Airtel and Idea have already filed a plea with TDSAT over TRAI’s decision allow Jio to extend its free services beyond the set 90-day limit. Vodafone has also written a letter to TRAI stating that Jio is still “luring customers” to subscribe to its Summer Surprise offer.